Your options for IT outsourcing today are unlimited. All you need is a laptop or desktop, and you can hire all the service providers you need, from cloud providers that bring you the Internet to managed service providers that run your infrastructure, to software providers that give you the tools you use in business every day. Deloitte says 31% of all global technology services fall under the IT outsourcing category, and that number is increasing. Let’s look at all the options for an insurance firm considering IT outsourcing. What’s available today and how can it help your business improve? The evolution of the internet has brought us dozens of new service models tied to IT outsourcing. IT outsourcing prior to the early 90s was practically unheard of; today, it’s a global phenomenon. 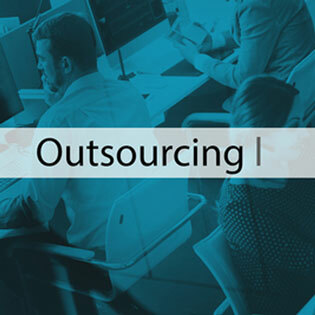 IT outsourcing is important for firms seeking to streamline operations, cut costs, and expand services quickly yet in the most fiscally responsible way possible. These cloud-driven services are subscription based, allowing for a fixed, budgeted line item that is typically more appealing than the “surprise” costs that come with broken on-premise equipment. Today, IT outsourcing can encompass infrastructure or software, maintenance, and support. Insurance agencies can eliminate or supplement IT technology workers with IT outsourcing. If your insurance firm has elected multiple IT outsourcing partners, it’s typical to hire a managed service firm to handle all of the vendors that make up your infrastructure along with monitoring the security and safety of all the component parts. Business process outsourcing allows a task to be outsourced. That could include anything from payroll to client billing. Knowledge process outsourcing can include strategy development or anything that requires general technology expertise, such as maintaining network security. Software as a Service (SaaS) that could include anything from the office programs you use to statistics-based programs that help with planning. Platform as a Service (PaaS) such as web developing, hosting, email servers, virtual machines, and more. Infrastructure as a Service (IaaS) includes the backbone technologies that run the web of your interconnected services, including firewalls or other hardware. Security as a Service (SECaaS) outsources all of the tools and processes that keep your critical business functions secure from a data breach. Today you can also outsource your database infrastructure and management, or use an off-site company to handle customer helpdesk, or even have a managed service provider manage your corporate cell phones. This has been a boon for small companies seeking the tools and infrastructures needed to stay competitive. Many of these firms lack an internal IT support team; simply put, IT outsourcing helps their business stay in business. Like any service, IT outsourcing brings pros and cons that every business should consider. Access to expertise a small business normally couldn’t afford. Eliminates big upfront hardware expenditures. Safer than running an in-house server room. Allows for flexibility to scale up or down as needed. If you elect to take your business overseas, there can be language barriers. Time zones can cause complications. There can be slower turnaround times due to language and time zone challenges. Your IT outsourcing partner is exactly that – a partner. Think about what would happen if your computers went down for even a day and you’ll understand why these partnerships are so important. An outsourced help desk may be the first point of contact that some customers have with your company. Would you trust this to just anyone? When considering IT outsourcing it’s important to get an assessment of your IT efficiencies as well as any challenges you may be struggling with. IT outsourcing with a managed service provider is the great equalizer for the small to mid-size insurance agency that lacks the internal teams to handle today’s complex infrastructures. Enterprise level organizations use managed service providers to handle pieces of their technology infrastructures, freeing up their in-house teams to focus in on specific tasks. TOSS C3 handles the strategies, configuration, and maintenance of IT architectures. Our experienced team is here to help your business secure its data and become more efficient in order to achieve and maintain a competitive advantage. Contact us today!